There are many plant layers to successful ecosystems-from the ground cover, herbaceous plants, shrubs, understory up to the tall canopy layer. Each level plays a vital role in the health of the ecosystem and biodiversity in the landscape, but the understory is an often overlooked layer in our home landscapes. We often plant lush gardens filled with flowering plants, a few ground cover plants, some shrubs and of course we all know Cape has plenty of canopy trees shading us! The understory level is typically trees ranging in height form 15-49’. These understory trees play a vital role in creating a balanced ecosystem by providing food and shelter for much of our wildlife, including birds and small mammals. There are many native understory trees that have high wildlife value as well as providing beauty to your landscape throughout the seasons. There are the beautiful purple flowers in early spring from the Eastern Red Bud, the vibrant yellows of the Spicebush and Paw-paw trees and the eye-catching fall display of yellows, reds, copper and deep purples. Fall is the best to time to plant, particularly these understory trees as they will have all winter to set strong roots without worrying about the heat and drought they face in the summer. Here is a list 10 understory trees that will enhance your landscape and benefit wildlife. Cercis Canadensis –Eastern Redbud nothing says spring like the glorious purple blooms of the Redbud blooming along the roadways, parks and neighborhood streets. These early blooming trees offer an early source of nectar for foraging insects and bees. The leaves, seeds and blooms are utilized by songbirds, pollinators and mammals. Redbuds tolerate part-shade to shade, making an ideal specimen tree for many Cape yards. Amelanchier Canadensis –Eastern serviceberry this wonderful tree provides 3 seasons of interest starting in early spring with beautiful white flowers of high value to many of our native bees, followed by berries that feed robins, catbirds, chickadees and cardinals. In the fall leaf color is spectacular. This moisture-loving tree can be planted in sun to shade conditions. Chionanthus virginicus -White Fringe tree this 15-30’ tree is known for its nodding clusters of fragrant white blooms. One of the last trees to leaf out in the spring, it often appears dead until the leaves and flowers emerge. The flowers are pure white, wispy and cloud-like. The blue plum-like berries are attractive to birds and mammals and the flowers are attractive to many pollinators. Asimina triloba -Pawpaw this multi-stemmed tree grows 10-40’ high with large tropical-like leaves that turn a beautiful yellow-green in the fall. The small banana-tasting fruit makes a delicious jam if you can harvest it before the opossums, squirrels, raccoons and birds eat them! The Pawpaw is also the only host plant for the Zebra Swallowtail Butterfly. Corylus Americana -American hazelnut a beautiful 6-12’ tall thicket forming shrub that provides interest to your landscape across the seasons. There are showy yellowish-brown catkins in late winter-early spring, and fall colors varying from bright yellow to deep-wine red. This part-shade to shade-loving shrub will do well in dry to moist areas. The nuts are enjoyed by birds and squirrels. Prunus Americana -American Plum a thicket-forming small tree with a spreading crown, showy white flowers and red plums. This small tree grows to 35’ with white flowers that come out before the leaves in spring, followed by shiny bright red fruit in later summer. The plums are not typically eaten by wildlife but the tree offers valuable nesting cover and is a host plant to many butterflies. Prunus virginiana –Chokecherry dense clusters of small white flowers followed by red to dark purple berries characterizes this small 20-30’ tree. The chokecherry can tolerate dry and moist soil along with shade to part shade to sun. The blooms offer a showy ornamental look in spring and early summer while the tree itself offers erosion control. The blue-black cherries are an important food source for wildlife and it is a host plant to many species of moths and butterflies, including the hairstreak, sphinx moth and silk moth. Sassafras albidum -Sassafras an aromatic 35-50’ deciduous tree that features horizontal branching that can grow from shade to sun in moist woodlands and along roadsides and tolerates infertile soil. The sassafras’ attractive foliage and ornamental blooms along with brilliant fall color makes this an attractive addition to your landscape. It is also an important host plant for several butterflies and moths, including the spicebush swallowtail, pale swallowtail and tiger swallowtail butterflies as well as the promethean silk moth. Juniperus virginiana -Eastern Red Cedar the most widely distributed eastern conifer across 37 states is extremely resistant to drought, heat and cold, and grows 30 to 40’ tall. This beautiful tree offers many benefits for wildlife: the berries are a staple to many birds and mammals, including the cedar waxwing named for this tree, and provides excellent nesting material and cover. 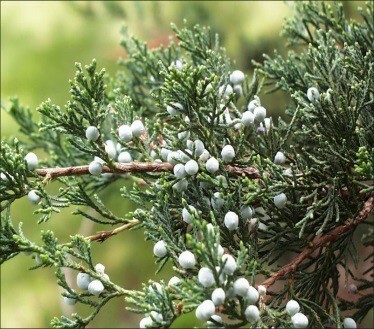 Eastern Red Cedar performs well in dry areas from sun to shade. Malus coronaria –Sweet crabapple typically grows 20-30’ tall with beautiful white flowers tinged rose and an inconspicuous yellow-green fruit. It can be found growing in part shade with moist soils on woodland edges and stream banks. The thickets provide suitable habitat for nesting, shelter and food for large and small birds. The crabapple is of special value to native bees, honey bees and is an important host plant for the red spotted purple butterfly.